Over 30 Years of Expert Service! There is no tank too big or too small for Windmill's expert crew to handle!!! Call Today for FREE Advice and a Free Estimate! Windmill Oil Tank Service is a full-service environmental consulting firm dedicated to achieving your individual environmental needs. Our mission is to act as your lead environmental advisor. We will work with you to clearly identify the critical paths, anticipated timeline, and estimated costs for your environmental project. Get to know a little bit more about us with a personal letter from the business owner/founder. Q: How long is my new tank guaranteed for? A: It depends on the type of tank. Guarantees generally last for 10-30 years depending on the model of the tank. Q: I converted to gas recently. Is it necessary to abandon or remove my existing oil tank? A: Absolutely. An old oil tank still has some oil and sludge in it, even if it has been pumped out. After a period of time, it is bound to decay. This will cause an oil spill, and it will also cause the ground to sink. Q: How long will my work take? A: An above-ground or basement installation should take about half a day. A buried installation typically takes a full day. Foam abandonments take up to an hour and a half, depending on the temperature. Sand and slurry abandonments will take no more than a day. Q: How long does it take to remediate an oil spill? A: Oil Spills are harmful can cause serious environmental problems. For this reason, Windmill makes spill remediation a priority and may take as few as 3 days up to several weeks. Q: Do you work in the rain/snow? A: Yes, Windmill is committed to completing every project as quickly and efficiently as possible. Because of this, our expert technicians work in the rain and snow. Short of a weather disaster, Windmill will be there!! Q: Do you require a down-payment? A: Down-payments are preferable, but not necessary. Q: Do I have to be home? A: For installations, buried removals, and any other work that requires access to the inside of your house, you absolutely must be home. However, no one needs to be present for an abandonment because no access to the house is required. Q: What do you do with the oil you removed from my tank? A: Oil taken from an abandoned or removed tank is transported to a licensed disposal facility. Q: What do you do with contaminated soil? A: Contaminated soil is first stockpiled on site until it is approved for disposal. It is then carted to a licensed facility, where its contaminant levels are checked. 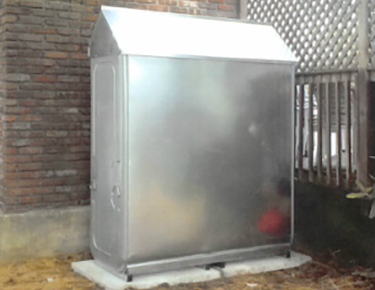 This is an Underground Fiberglass Oil Tank which can be used for a residential or commercial building. 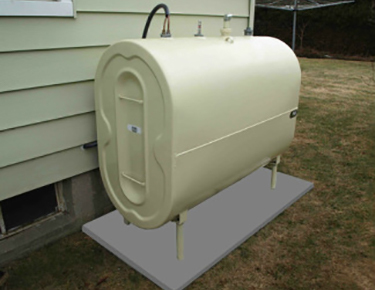 This is an Above Ground Indoor/Outdoor Granby 275 Oil Tank. This is our most popular oil tank. 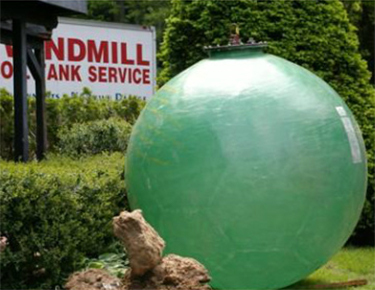 Windmill Oil Tank Service is a Platinum Awarded Granby Installation Contractor. Here is a Roth Double Wall Indoor/Outdoor Oil Tank. This tank is preferred by many because of its economical and compact design. This design can easily be fit in a basement or outdoors. The Roth Tank is both aesthetically and functionally pleasing! Here is a Geo-Probe testing the soil surrounding an underground oil tank. 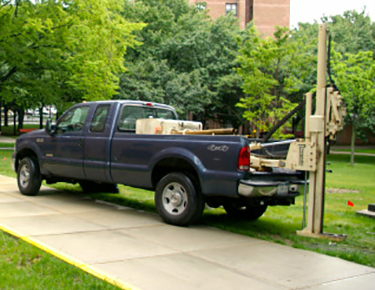 The Geo Probe is the most common and most efficient method of obtaining subsurface soil samples. The machine utilizes the Macro-Core Soil Sampler. This sampler consists typically of a 4' long coring barrel that is advanced into the ground using a Geo Probe DPT hammer. Many people think if they have an underground oil tank that they must test the tank itself to see if there are any leaks or problems however, the Geo Probe Soil Sampling method the most common and effective testing method for underground oil tanks.